Totally Spain is delighted to have been approached a few weeks ago for sponsorship by a dynamic theatre company Tangram Theatre in London. 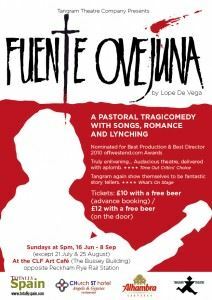 We have since grown fond of these guys and their work and we’re looking forward to seeing their production of Lope de Vega’s Fuente Ovejuna in London this summer. They have a great track record and it’s some story! 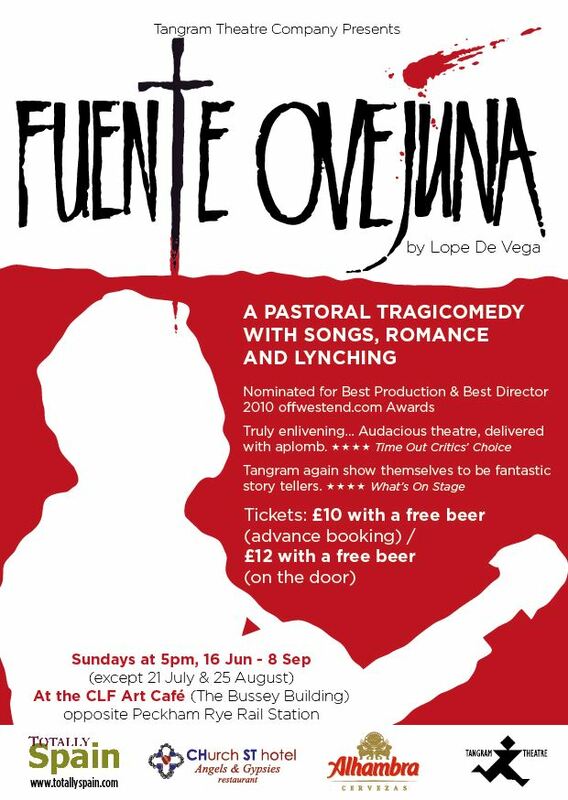 When the company first staged Lope De Vega’s Fuente Ovejuna in 2010 in the Southwark Playhouse, it was awarded Time Out Critics’ Choice (read the magazine’s review here) and was nominated for best show and best director at the Offwestend.com Awards. Well – Lope de Vega has a way of getting under your skin – and so, Tangram Theatre is re-staging this great classic this summer in the CLF Art Café in Peckham, London. The Fuente Ovejuna Preview show on Sunday June 16 was a great success! 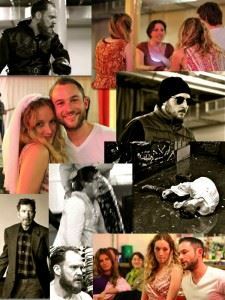 “This production smashes down the fourth wall to invite the audience to become one of the villagers of Fuente Ovejuna. Will the audience rise up to destroy the tyrant? And in rising up as a mob, where does individual responsibility for collective violence lie? Mashing together Lope’s classic text with modern day pop songs, audience participation, excerpts from Shakespeare, and a Richard and Judy-style King and Queen of Spain, this adaptation invites audiences to discover Lope’s pastoral tragicomedy in all its bucolic slapstick humour and gut-wrenching brutality. 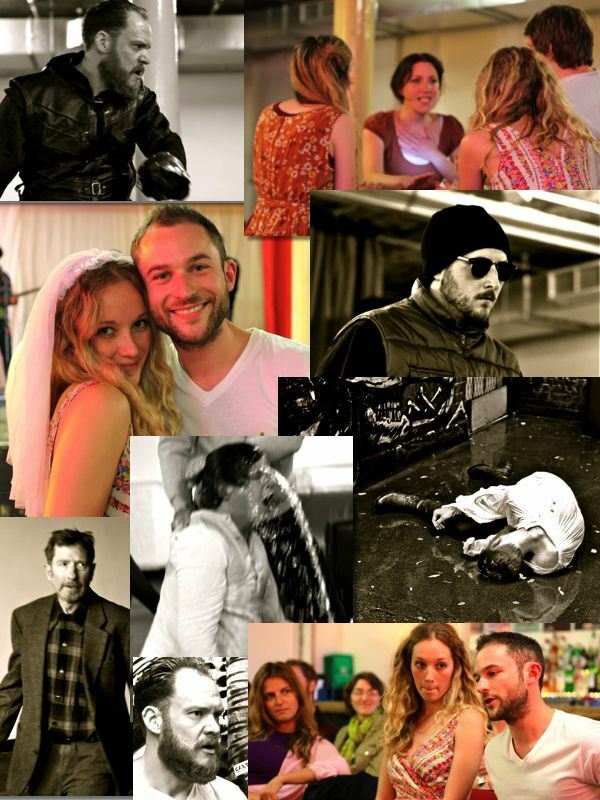 To get a sense of just what is happening in the story – have a look at the video about the play’s characters put together by Tangram. Dr. Peabody was the first live band performing the soundtrack at the preview on June 16. You can hear his vocals here on a track called Banker Pubs. And Flamenco Express also performed – and stayed on afterwards to teach great flamenco tunes and moves! On June 23rd the band will be MFC Chicken. And have a listen to James Wolff who’s also agreed to play at one of this Summer’s shows. Performances take place at 5pm on Sundays from 23rd June to 8th Sept 2013 (except the 21st July & 25th August). Tickets cost £10 in advance, £12 on the door – both tickets include a free beer! Break a leg – you guys! Interested in Lope de Vega? If you can’t get to London – but can get to Spain we think you’d like the Catalan production of the Fuente Ovejuna on July 20 (plus a whole lot more) in this year’s Almagro International Classical Theatre Festival in Ciudad Real, Castilla-la-Mancha. Totally Spain would be happy to organise your trip. You could fly into Madrid and stay, quite appropriately, at the superbly located four-star Hotel Lope de Vega near the Prado Museum as a starting point! [That’s where we are sending the winner of the prize we are sponsoring for the Tangram London production!] If you are a fan of the play or the playwright, we can arrange tickets for the Almagro Festival and come up with a customised Lope de Vega trip just for you. Posted in Castilla la Mancha, Entertainment, Spain and tagged 1472, 2013, CLF Art Café, Dr. Peabody, Fernan Guzman, Flamenco Express, Frondoso, Fuente Ovejuna, James Wolff, Laurencia, London, Lope de Vega, MFC Chicken, Tangram Theatre, Time Out Critics’ Choice, wedding band.